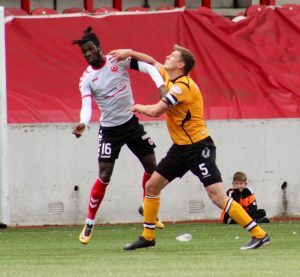 Annan are still seeking that elusive first victory of the season after ex players Barry Cuddihy and Smart Osadolor scored the vital goals for the home team which denied Annan a share of the points. Annan’s tight squad was hampered by the unavailability of Steven Swinglehurst and Dan Orsi but new loan signing Luke Brandon from Dunfermline Athletic made his debut from the bench in the second half. Ayrton Sonkur also made his debut partnering Peter Watson at the centre of the Annan defence and Rabin Omar made a return following his suspension carried over from last season. Annan started the game very promisingly as Aiden Smith’s 6th minute free kick presented an opportunity but the effort failed to hit the target. At the other end Clyde won a 10th minute free kick in a promising position but Darren Millers effort was easily saved by Jim Atkinson. The impressive Owen Moxon’s penetrating run finished with a through ball to Aiden Smith who tested Blair Currie. Minutes later as Annan continued to take the game to the home team Moxon burst through into the box finishing with a shot which was well blocked by the Clyde defence. Goodwillie and Ramsay combined in the 25th minute with Atkinson saving the volley finish, in the 29th minute Atkinson denied Goodwillie when he pushed the effort round the post. Cuddihy opened the scoring in the 34th minute and it was brilliant strike from the ex Annan player who’s low shot from the edge of the box was perfectly placed past the outstretched arm of keeper Atkinson. Clyde’s best move of the match just before the interval saw Goodwillie and Cuddihy break down the right ending with a cross ball to Ramsay but Annan defended the excellent opening to deny Clyde a second goal. The second half like the first produced some excellent football, Aiden Smith was denied by an important challenge from McNiff in the 63rd minute but it was Smart Osadolor who grabbed the decisive second goal for the home team. It was an unfortunate goal for Annan to concede after the ball fell kindly for Osadolor following a challenge by Sonkur and as the goal opened up the striker rolled the ball into the net past Atkinson. It was a cruel blow for Annan but it gave the home team a 2 goal cushion. Blair Currie pulled off a fine save to turn Omar’s header past the post as Annan went all out to reduce the lea way. Stevenson’s powerful free kick strike in the 70th minute tested Currie and in the 75th minute Stevenson cracked the upright as Annan continued to take the game to Clyde. Annan made the breakthrough in the 77th minute when Rabin Omar headed Moxon’s free kick over the head of Blair Currie. It was a fitting reward for Omar who had a couple of earlier efforts saved by Currie. It was a nail bighting end for the Clyde fans as Annan pushed forward in an effort to try and salvage something from the match. We now move on to the mid week Irn Bru cup tie against Celtic on Tuesday evening at Galabank . Clyde – Blair Currie, Callum Home, Jodan Stewart, Martin McNiff, Jack Breslin, Barry Cuddihy, Darren Miller , Mattew Flynn (Max Wright 71 min), Kevin Nicol ( Smart Osadolor 44 min), David Goodwillie, Darren Ramsay (Mark Burbidge 90 min). Subs not used Ilies Belcacem, Jack Harrison, Aaron Miller , Lewis Wilson. Annan – Jim Atkinson, Scott Hooper, Jack Brannan, Peter Murphy ( Brandon Luke 45 min ), Peter Watson, Ayrton Sonkur, Ryan Sinnamon ( Trialist 77 min), Owen Moxon, Aiden Smith ( Trialist 87 min), Ryan Stevenson, Rabin Omar. Subs not used Alex Mitchell, Raffi Krissian, James Creaney, Ellis Pearson. Assistants – Willie Conquer and Blair Fraser.